There are about 6,900 living languages in the world. By 2100, experts predict, 90 percent of them will cease to be. Once a language dies, the DNA of an entire culture vanishes with it. This dire scenario has prompted the National Endowment for the Humanities, the National Science Foundation and the Smithsonian Institution to join forces in what has been called no less than a rescue mission. In 2005, they awarded a first round of grants totaling $4.4 million to support efforts to document many languages before they become extinct. 100,000 is the number of speakers needed for a language to be considered “safe.” Only a dozen or two fit that description. 516 languages are considered “nearly extinct,” defined as having fewer than 50 speakers. In many cases, only a few elderly speakers are still living. The world’s tongues stack up pretty unevenly. The vast majority of them—some 95 percent—are small, with fewer than a million speakers each. That spreads them across just 6 percent of the population. Only a few hundred major languages together account for the rest of the world’s population. 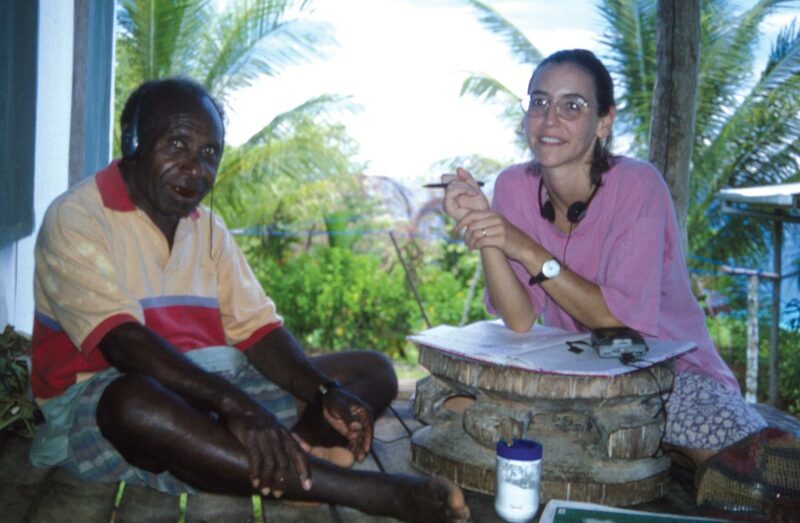 As part of this push to preserve endangered languages, Lise Dobrin, a linguist and research assistant professor in anthropology at UVA, is creating a digital archive of linguistic materials for the Papua New Guinean language Arapesh. Her particular focus is a dialect called Cemaun, now spoken by fewer than 100 villagers. In collaboration with UVA’s Institute for Advanced Technology in the Humanities, Dobrin is building an archive consisting of a dictionary, searchable texts and audio recordings that promises to be a robust research tool for linguists and other scholars. It will also be an enduring record of this language on the brink. She spent 15 months in the remote mountaintop village of Wautogik, population 400, in the province of East Sepik. What she discovered when she got there was that no one under the age of 40 knew how to speak this remarkable language. Clearly, it was on the fast track to oblivion. The archive, which Dobrin will begin making available electronically later this year at arapesh.org, will include traditional and modern legends, spontaneous narratives, casual conversations and “recipes” for constructing objects of cultural value. Existing sources about Arapesh are fragmentary; the Cemaun dialect lacks any documentation at all. Smaller than Texas, Papua New Guinea supports some 800 indigenous languages. But in some villages, people routinely speak Tok Pisin, an English-based creole that has become the country’s lingua franca. “In Wautogik, the children now only speak Tok Pisin,” Dobrin says. This loss of their ancestral tongue is, in many ways, a textbook case of “language shift” that leads to extinction, according to Dobrin. Languages die out from a number of factors—modernization, bilingualism and migration are among the chief culprits. Linguists like Dobrin sum it up in one word: roads. Paradoxically, she notes, this disintegration of Cemaun has been accelerated by the villagers’ own high rate of success in education and employment. As people leave the village seeking opportunity in towns, cities and abroad, they become reliant on Tok Pisin and, increasingly, English. The practical effects of this loss are profound. Cultural knowledge is often language specific—untranslatable—such as remedies for diseases. Arapesh elders complain that their sons cannot locate the right types of trees to build houses because the labels that convey this knowledge about the natural world aren’t all known by the younger generation. The village leaders have strong feelings about cultural continuity, she says. Witnessing their language slipping way is something they deeply regret, “yet they find it hard to know what to do about it,” she says. Whether this latest initiative by the NEH and its partners can turn the tide remains to be seen. Certainly, the push to document the world’s many minor languages has become a priority in the field of linguistics in the past decade, Dobrin notes, spurred by scientific and ethical demands to preserve those that were disappearing apace. “The feeling was that we linguists can’t sit idly by as our subject matter disappears,” she adds. Dobrin’s project has particular urgency. Since her fieldwork, many of the people whom she befriended in Wautogik have died. Her closest consultant, a villager named Matthew Rahiria, who was gifted at explaining many of the subtleties of his native tongue, also has passed away. Dobrin hopes the digital archive will lay the foundation for a subsequent project she has in mind: an Arapesh primer for children in Wautogik, to be used in their preschool and primary school.